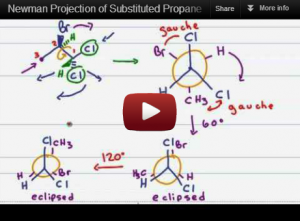 This tutorial video shows you how to find and draw a Newman Projection for a substituted propane molecule even when some of the atoms are not directly visible. This is Video 3 in the Newman Projection Video Series. Click HERE for the entire series. i dont understand why we have to shift the front carbon a little to the left. Is it compulsory? Mees_Tee which point in the video are you referring to? I can’t thank you enough for all you have done for us !! Thank you Shahad. Organic chemistry is a really fun topic if given the chance. I’m glad you’re able to figure this out during the semester. I find that if you enjoy what you’re studying you tend to work harder and do better in the long run.